Root canal treatment, also referred to as root canal therapy or endodontic therapy, is made necessary when a cavity is allowed to reach all the way to the dental pulp. Sometimes restorations or trauma to a tooth may also cause the nerve to be damaged to the point it needs root canal treatment. Once this occurs, the pulp becomes infected and can even extend through the root tip and begin to eat away at the surrounding bone (this is an abscess). By the time the pulp is infected, it cannot heal on its own and must be treated. It can even weaken the entire immune system which is very dangerous, not to mention very painful. Symptoms that the pulp has become infected may include sensitivity to hot/cold or sweets, pain, swelling, pain with biting or pressure, and a bad taste in the mouth. However, sometimes no symptoms are apparent and the problem isn’t discovered until a checkup. 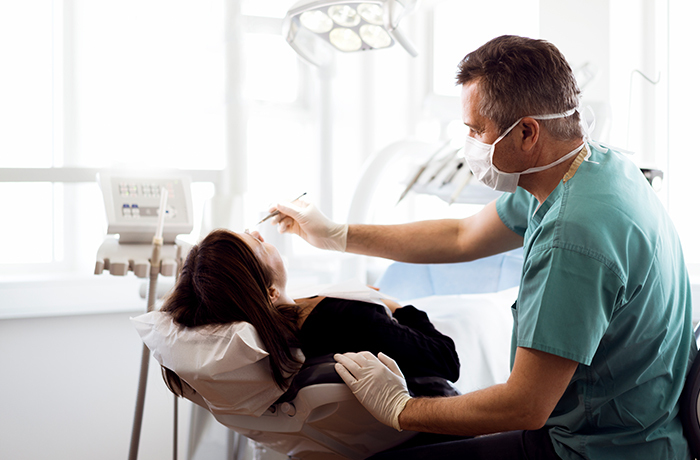 A root canal is then performed to clean out the infected tooth pulp and disinfect the canals of the tooth. The only other treatment would be to extract the tooth. Once the infection is resolved, the canals are filled in to prevent any further infection. Usually a core buildup and crown is recommended for restoring a tooth that has had root canal treatment. Regular cleanings and checkups can prevent and detect problems early.